Come mix and mingle with other Financial Technologist’s Tuesday January 22nd. Learn about the newest and fastest changes going on in financial technology. Finance is undergoing a massive change some call the “financial paradigm” or “crypto wars”. Laws from 1930-1940 (old right?) are getting broken down with technological innovation in finance. 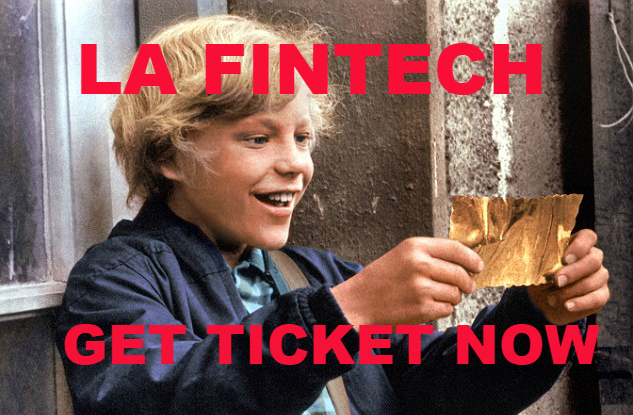 Find partners, talk about your project, bounce ideas, discover LA Fintech. If you want to do a future demo, sign up HERE (plan 1-3 months lead time). If you’re an investor and want to talk, sign up HERE . Also, add your company to LA Fintech directory so others find you. 12-8 Brunchwork w/ Lime & Upfront Ventures- Join us at brunchwork to connect with industry leaders and meet brilliant peers over a farm-to-table meal! On Saturday, December 8, brunch with Chang Xu, investor at Upfront Ventures, the top VC firm with investments in thredUp, Parachute, Ulta & more. Plus, you’ll meet Leila Najafi, Culture & Entertainment Manager at Lime, the hot bike & scooter startup that’s raised over $335 million. RSVP HERE & use code LAFINTECH for 20% off.